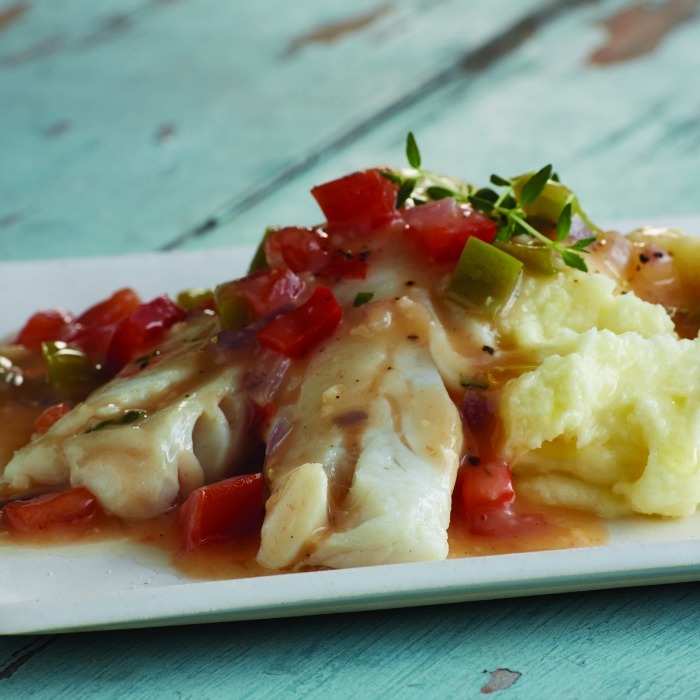 For a dish you can easily make heartier, serving over mashed potatoes, or lighter for a warm summer evening, try this smothered cod or pollack recipe. With summer, I often turn to fish for dinner. I can serve it over potatoes, with salad. Really, the possibilities are endless. Pollack: What’s in a name? For many ingredients, substitutions are no problem. 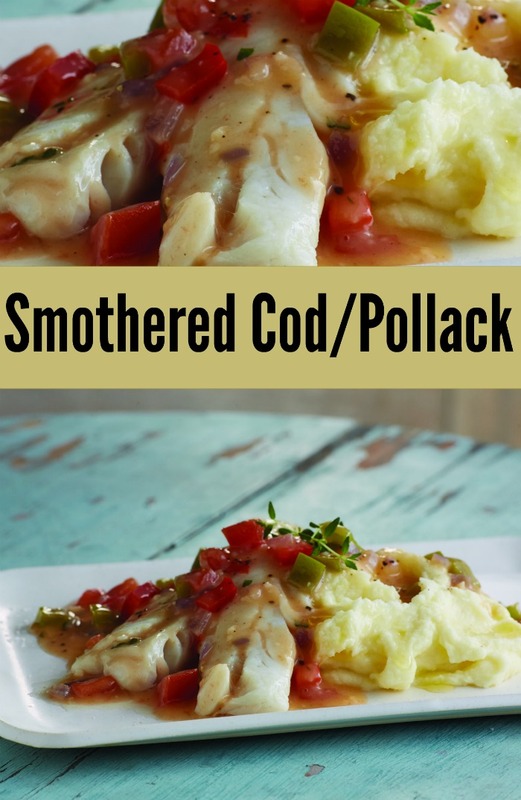 For example, pollock, which is a member of the cod family and shares many of its attributes, including a firm texture, mild flavor and snow-white fillets loaded with lean protein, works in any recipe calling for cod. In hot saute pan, cook olive oil, onion and garlic for 1 minute. Add both peppers and salt and pepper, and saute 2 minutes. Add flour and stir until flour turns light brown. Add chicken stock and stir until liquid smooths and starts to thicken. Season fish with salt and pepper, to taste, and place into simmering sauce and cover. Cook 3-4 minutes, carefully turn, cover and continue to cook until done, 3-4 minutes. Find more summer dinner dishes on The Jenny Evolution! Easily made heartier, serving over mashed potatoes, or lighter for a warm summer evening. « Welcome to Camp Jenny! Well, with this recipe I found that I am not a fan of Pollock but the broth was exceptional especially when you add some Old Bay!